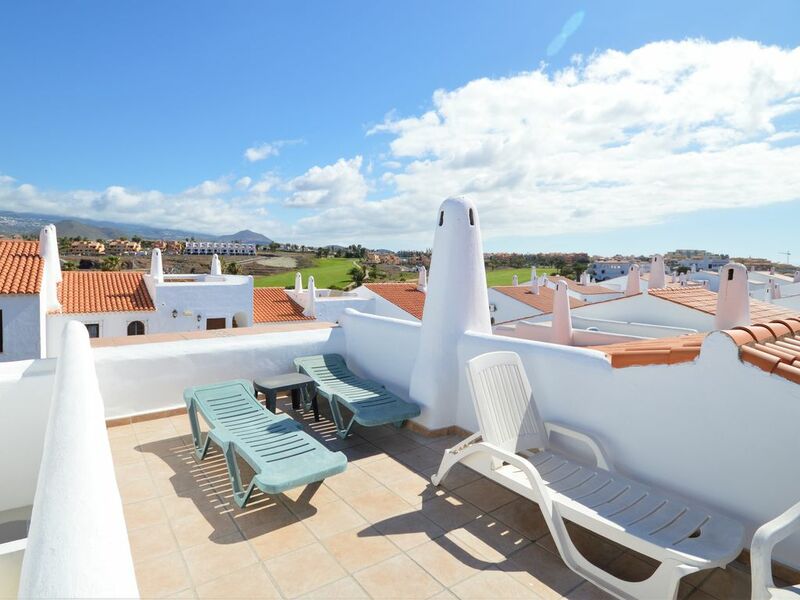 This one bedroomed penthouse apartment is on the top (2nd floor) with a balcony overlooking the pool, gardens, sea and volcano. Being south facing there is plenty of sun too. The lounge has a very high ceiling and thus is exceptionally airy and cool. It opens onto two separate balconies for panoramic views of the countryside. This apartment was refurbished during 2016 and is equipped with all mod cons ensuring a 'home from home' feeling. The lounge has a stereo, digital flat screen TV, WI-FI, DVD and video and all rooms have ceiling fans. The American style kitchen is all electric and has oven, hob, extractor, microwave, etc.. These exclusive penthouse are privately owned - there should be no confusion between these magnificent properties & some other sparse holiday properties offered by others. 'Fairways' is a quiet and secure complex built in Andalusian village style. There are sub tropical gardens and an immaculate heated swimming pool which has a professional full time life guard. The accommodation and resort are ideal for families and those seeking a quiet haven in which to relax. These apartments were completely refurbished in 2018 and now have FREE unlimited Wifi . MOST important are the south-facing terraces / balconies to ensure all day sun, plus a full sized rooftop sun decks for the two bed property. There are breathtaking views of the sea in one direction and Mount Teide volcano the other. Cool tiles cover the floor and all lounges are very spacious. Both have English TV, , DVD & Audio. The kitchens are modern fully equipped with hob, oven, microwave, washing machine, toaster, etc. There is no charge for utilities or lining. Welcome Packs: If you are arriving 'out of hours' when the Supermarket is closed you will not starve as there will be a free goody pack waiting for you. Also there is a 24hour key collection service for 'out of hours' arrivals. Only a few penthouses at Fairways have south facing balconies over looking the gardens, which means that you get the sun from first thing in the morning until last thing at night. The views here are the best at Fairways can offer - directly in front of you are the gardens then there is the sea & coastline and to the rear you have the Mount Teide volcano. The Amarilla Estate is situated on the southern Costa del Silencio coast about a 10 minute taxi ride (€20) from the airport. It is perfectly situated midway between the airport and lively tourist areas of Los Cristianos and Playa las Americas. Fairways is a small private development self contained with a friendly village atmosphere. Built in Andulucian style it is situated in the middle of two lush championship golf courses. It is gated for security and exclusivity. Twenty miles to the north is the Mount Tiede volcano and a hundred yards to the south is the rugged Atlantic coast with dramatic walks. Here the beaches are shingle, but a short distance away in either direction, are safe sandy ones. On site there is a quality restaurant, several bars and car hire facilities. Adjacent there is a supermarket, a laundry, take away, and restaurants. Additionally there is 24 /7 British representative on hand to help with any emergencies,queries,excursions or money changing.